My records indicate that this was my sixteenth Racer-X show, but there may have been more that I forgot to record. I am (obviously) a super fan. Vin Shende, Bowdoin College music professor, was my neighbor when he and his wife first moved to Brunswick. I reread this article from The Bowdoin Orient and was reminded that Vin answered an ad in the paper when he auditioned for a band that bassist Pat Cyr and drummer Dave Morrill were trying to start. Vin’s Bowdoin colleague and friend, English professor Aaron Kitch, also auditioned, and Racer-X was born—Maine’s BEST 80s cover band. I’ve seen others, and none put on the show that Racer-X does. Check out some great Racer-X moments here. They have musical talent AND showmanship (something I’d argue some of the other 80s bands are lacking). 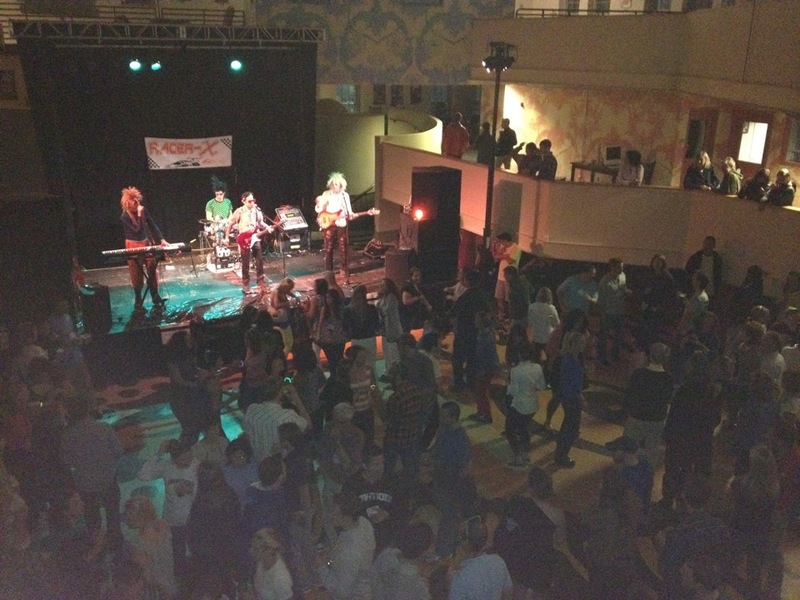 Bowdoin College very wisely hires Racer-X to play every year at Homecoming in the fall and Reunion Weekend in early June. I had already graduated by the time Racer-X came into existence, but Bowdoin has this way of making you feel welcome when you come back—even if it’s not your reunion year. A lot of my local friends are alumni, though, so we decided to combine our dear friend Courtney’s birthday celebration with a bit of Racer-X. It was a perfect idea. I think we had an entourage of close to fourteen people—half alumni and half not, but we decided we had enough polar bears in our midst to make it okay to hit up the show. Were any of us technically having our reunion? No. We have reunions every five years at Bowdoin, and Courtney (’06), her sister Kate (’11), and I (’01) all had ours last year. 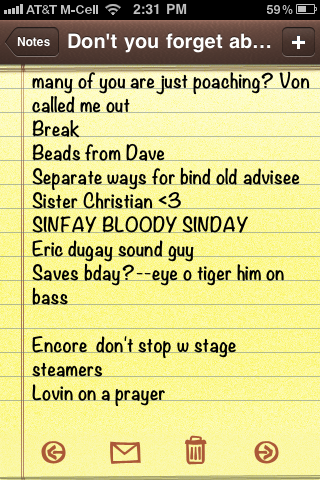 Racer-X’s show started late into our day of celebration, so I forgot my concert notebook and took notes on the “Notes” app on my iPhone. You can see by the photo that perhaps I wasn’t in the best shape to be taking notes, but I’m willing to blame it on auto correct if any of my students, my baby sister, or my dad is reading this. My notes from the evening. First shot. Racer-X played all the usual crowd favorites—Simple Minds’ “Don’t You (Forget About Me),” “Video Killed the Radio Star,” and “Come on Eileen.” Aaron Kitch slowed it down on keys for “Wishing Well,” and lead singer and guitarist Vineet Shende BEAUTIFULLY hit some killer high notes on “Your Love.” They did Cheap Tricks’ “I Want You To Want Me” and did a class roll call during the ever-popular “Love Shack.” I’ve been invited up on stage to do the “tin roof—rusted” part before—it made my life complete. At the end of the roll call—you get the idea—cheer if you’re from the class of 1967, 1982, 1997, 2002, 2007, etc. (and trust me, people were there representing all of those classes! )—Vin asked the crowd “How many of you are just poaching reunion?” He found me in the front of the crowd and shouted out my name in celebration of my devotedness (is that a word, Kitch?) to the band. The best part about my shout out is that one of my classmates was also there poaching, and he came and found me and we got to catch up and dance for a bit. I love Bowdoin. Racer-X’s talented drummer Dave (who plays an electric drum set at gigs) came to find me at the end of the break to give me some beads to wear—I was touched and always appreciate the special treatment of super fans such as myself! I can’t exactly decipher the notes I took next on my phone, but I think it says that Vin dedicated “Separate Ways” to one of his old advisees who was in attendance. They played my favorite—Night Ranger’s “Sister Christian,” that they very sweetly dedicated to me last year at my tenth reunion in honor of me graduating from Bangor Theological Studies that May. I totally freaked out (as I always do) when they played “Sunday Bloody Sunday.” My notes indicate that, too, as it reads—“SINFAY BLOODY SINDAY.” You get the idea. They often dedicate that song to U2/Racer-X super fan Kim Pacelli. The whole crowd jumps and down the entire song—guaranteed. 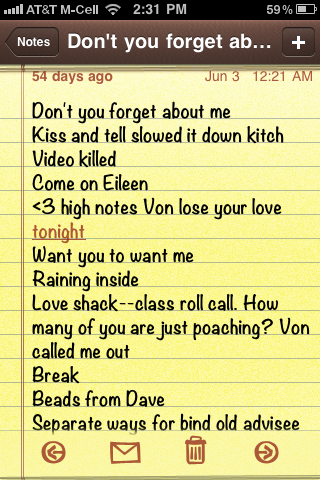 My notes from the evening. Second shot. The band gave a shout out to their devoted and talented sound engineer, Eric Dugay, who is probably a relative of mine based on the name alone. The next shout out was for drummer Dave because it was his birthday! Happy Birthday, Dave! He switched from drums to bass for “Eye of the Tiger.” My notes read: “Saves bday?—eye o tiger him on bass,” so that’s pretty clear, I think. I always bank on Journey and either Guns N’ Roses or Bon Jovi for the encore. And since Racer-X is awesome and such fun, we always want an encore. My notes indicate that the encore was “don’t stop w stage streamers.” Hmm…it must have been “Don’t Stop Believin’” with people from the audience rushing the stage to sing along. I’m still waiting for my invitation to sing that song with them officially since Aaron Kitch and I did a glorious duet of it at Sea Dog karaoke night. We killed it. I was once invited to sing “Like a Virgin” with them at a gig and quickly realized that I really only know the first verse and the chorus. Thank goodness Kim was there in the front to feed me the lyrics. That’s probably why my invitation for “Don’t Stop Believin’” hasn’t come in the mail yet! But I promise I know all of the words to it and am always ready, guys! Racer-X ended the glorious night with “Livin’ on a Prayer.” I can say with certainty that the prayer the crowd wants answered in that last moment of a Racer-X show is that the night won’t end. Racer-X is a blast. They are about to go on a bit of a hiatus while one of their members is in California for the year (unless they plan to have a temporary replacement? ), but they’ll be back in full force next summer and if you can see them live, definitely do not miss it! PS—A shout out to the Bowdoin reunion ambassadors who drove all of us home to Courtney’s house which is Bowdoin-adjacent in covered golf carts after the show ended. Bowdoin knows how to treat alumni well! Thanks! 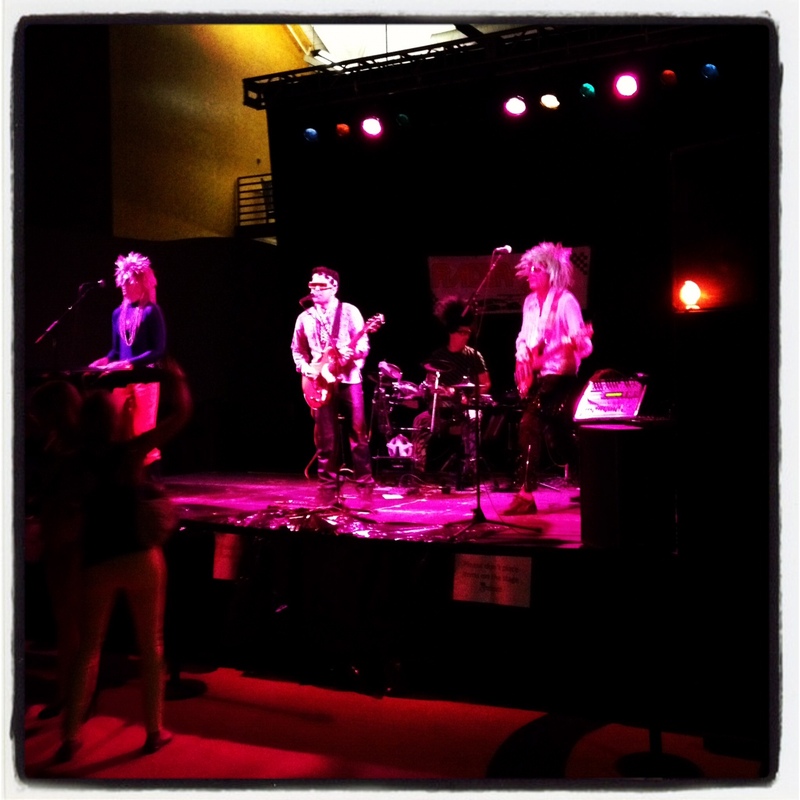 Go see Run on Sentence on Wednesday, August 1, 2012! DO IT! 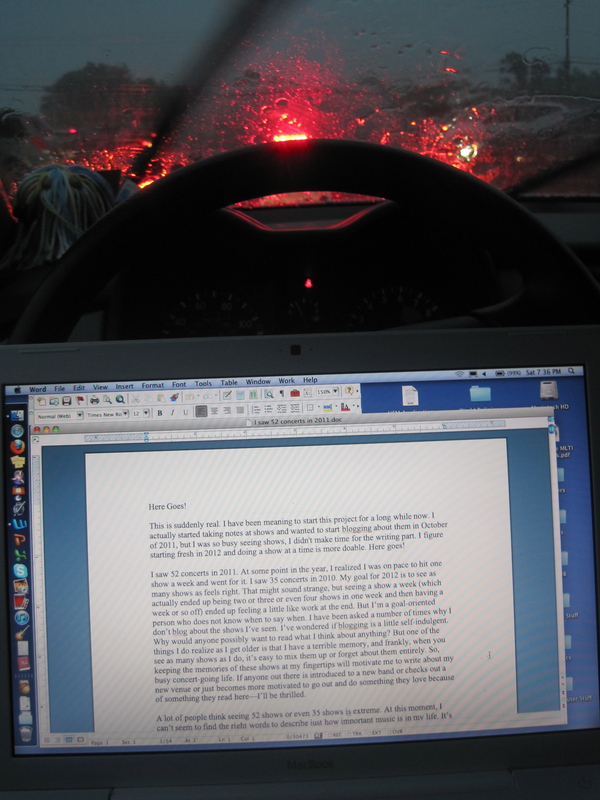 Blogging from the driver’s seat. I wasn’t moving. Promise. I don’t often do this, but I really want to encourage people to go see Portland, Oregon’s Run on Sentence Wednesday, August 1 at The Oak + The Ax in Biddeford. Tickets are a mere $8. I saw 35 concerts in 2010 and ROS was easily in the top three of the shows I saw. I liked ROS so much, in fact, that I went to see them again the following night at a different venue. I think Dustin’s songwriting is beautiful and layered—truly interesting and unique. 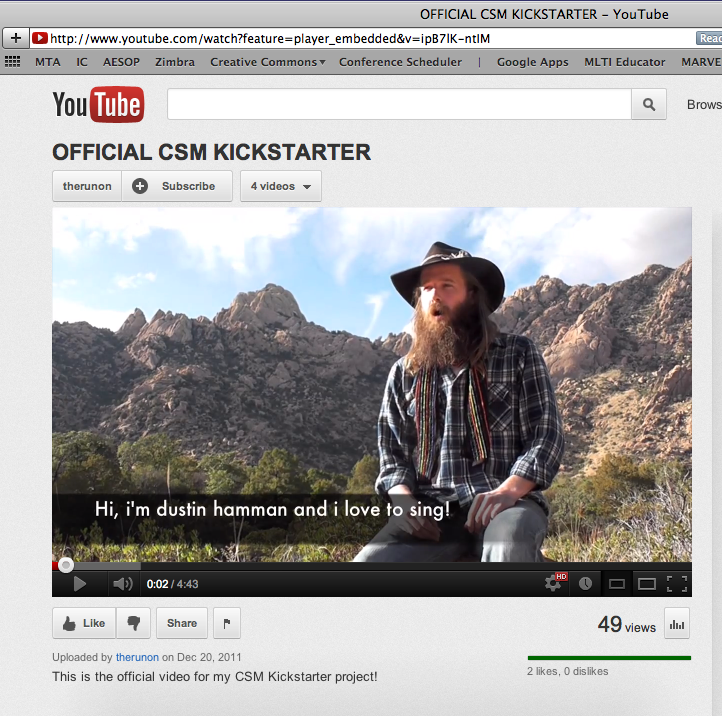 I supported Dustin’s Kickstarter.com drive to make some money to keep playing out and record some, too, by joining his “CSM”—“Community Supported Music” efforts. I get a song every month from him in my email inbox. You never know what you’ll get, and I love the variety. Anyhow, I’ll be there with bells on. ROS is only here once or twice a year, so you should really, really come out. I mean it! 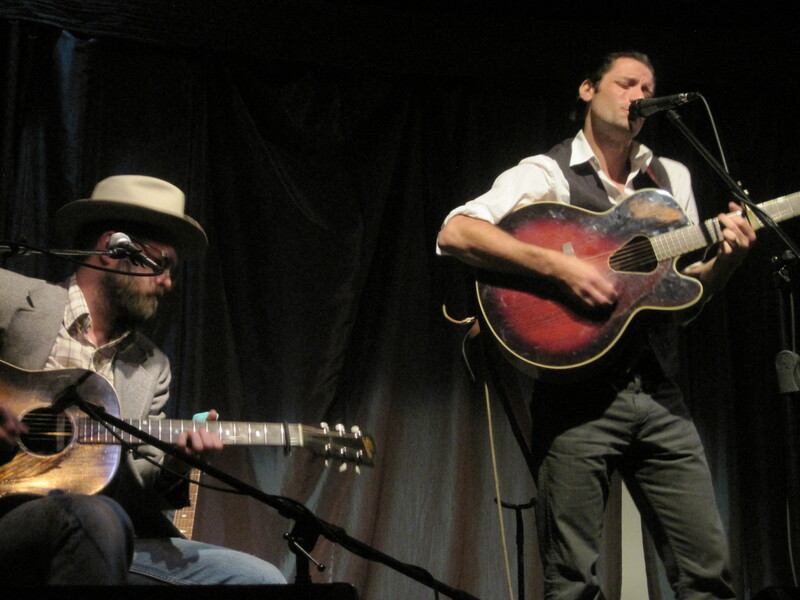 I saw Jeffrey Foucault and Mark Erelli at One Longfellow Square in December of 2011. They shared the stage the whole time and went back and forth singing each other’s songs. What I remember about the night was that I wanted to see Jeffrey solo. He has something special for sure. I’d had a busy day that day—shopping for gifts for my senior class officers, an impromptu dinner at Scarlet Begonias in Brunswick with great friends, and I even ran into one of my former students who is off to law school in California in the fall. I got to One Longfellow about half a song late, but just in time to find one of my colleagues, Grace, and her sister, Nina, sitting in the front row. Jeffrey Foucault is originally from Wisconsin and now calls Western Massachusetts home. His bio on his website shows he’s had a really interesting and unique life. Those experiences have certainly given him a lot of fodder for his songs. 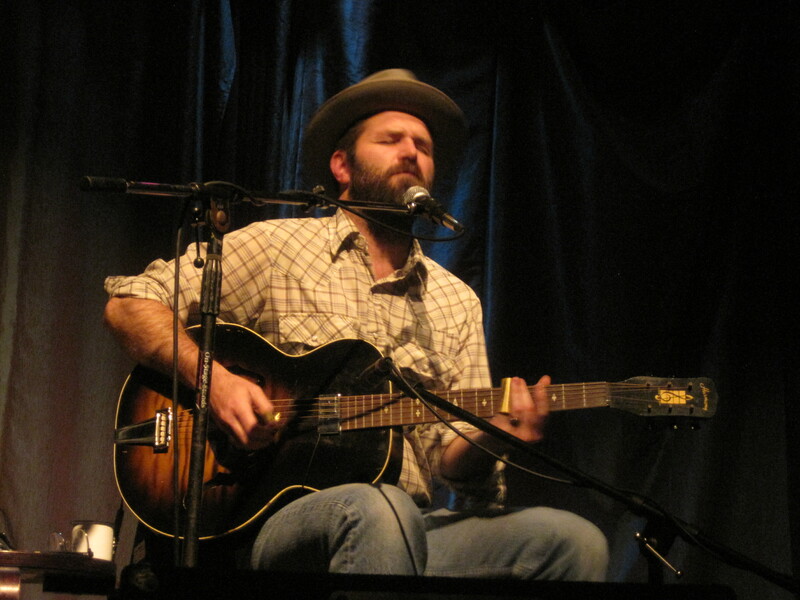 JF is a singer-songwriter—folky, a little country, delightful. Do not miss the chance to see him live. Also, the man could be a model. I wouldn’t be surprised if he’s modeled professionally at some point. Not that it matters, but it means I will always want to sit that much closer to the stage at his shows. He also dresses to impress—in vintage boots, a suit jacket, and cowboy hat. I like everything that comes out of Jeffrey’s mouth—he is a poet and his music is evocative. I especially liked “Tea and Tobacco,” after which JF invited singer-songwriter Caitlin Canty to the stage. He said he’d taken her to sushi for dinner, so she really had no choice but to sing for us. Caitlin was in Portland from Vermont working on a new record and her voice is beautiful. Being introduced to her was a real treat that night. Check out her song “Thorn.” Here’s a newer video of “Thorn” that’s really lovely, too. She sang a couple of songs with JF, including the haunting “Heart to the Husk,” that includes the heavy lyrics “Please burn my letters/Let them writhe/The love and the lack/Let the blue meet the black/Let my words become fire.” Caitlin’s voice added just the right touch. 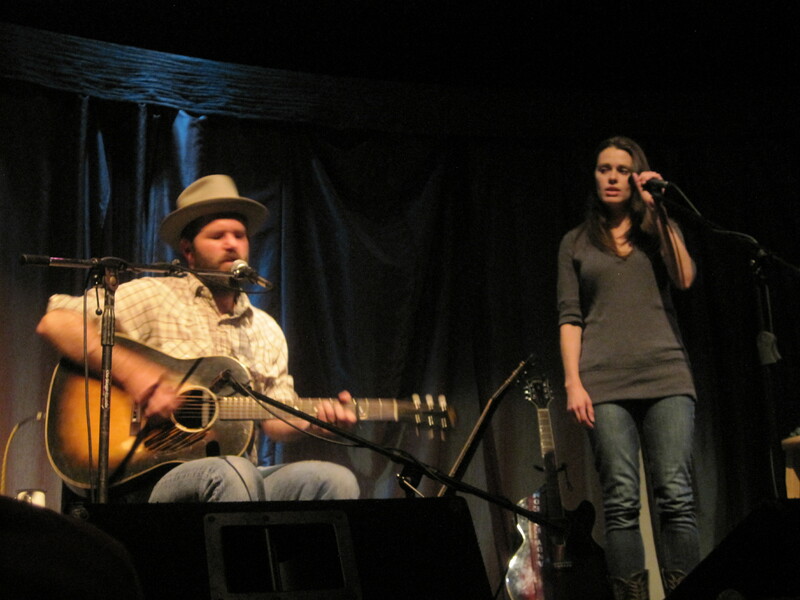 Fun fact: Andy Friedman, Jeffrey Foucault, and Caitlin Canty all have a song called “Idaho.” JF’s “Idaho” is on his newest album, Horse Latitudes, which is fantastic. Jeffrey is a family man and talked about his 4-year-old daughter a couple of times. He said that one of his “favorite things” about having a super verbal kid is that she remembers everything he says and repeats it at the worst possible time. He also said they’d been singing together over breakfast in the morning. Super cute. JF is married to the uber talented singer-songwriter Kris Delmhorst. She is not to be missed. JF closed the intimate night (there couldn’t have been more than 25 people in the audience) with “Everybody’s Famous” that he played for his buddy Steve who’d driven him the show, helped him set up, and had even helped him plant potatoes that morning, and closed with “Train to Jackson.” Even though we were a small crowd, we were appreciative, and JF obliged us with a beautiful unplugged encore—“Northbound 35”—with the help of Caitlin Canty. I got to talk to Caitlin for a bit after the show and she was a delight. And Colin from anna & the diggs was running sound at OLS that night. There’s so many talented musicians in Portland—I guess you never know who you’ll run into. How lucky are we to have that going for us? !